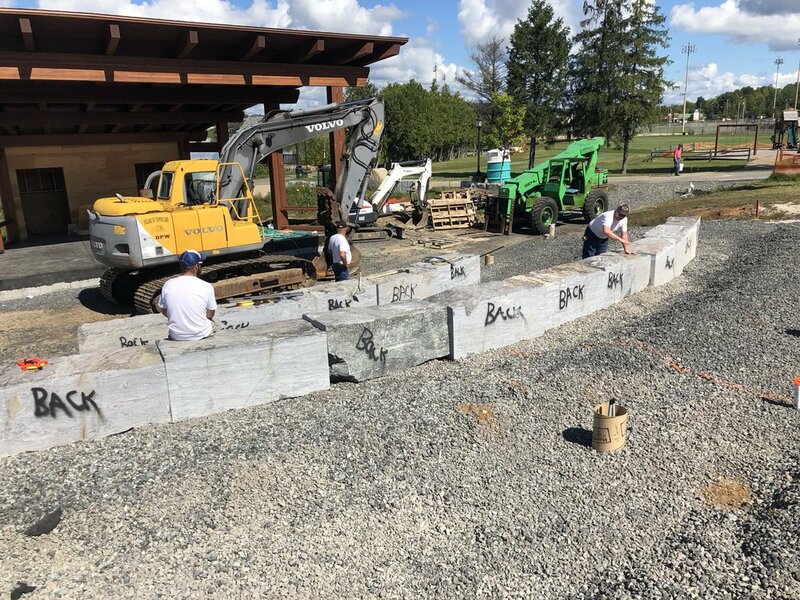 In an impressive undertaking three local volunteers moved over two dozen massive granite blocks into place Saturday in front of the Lions bandshell in the Village of Tupper Lake's new performance park below Martin Street. The stones which were cut about two degrees on each side to form semicircles of about a dozen pieces each measured approximately two feet wide, two feet deep and five feet long. Each weighed two tons. Because the large pieces were not exactly two feet high- varying by as much as two inches at times- crushed stone that had been placed in the seating tiers earlier by Lemieux Contracting and Kentile Excavating had to sometimes be massaged by hand shovel to arrive at the desired thickness. Black dirt will be placed behind each stone to form a 12 wide seating tier in front of the new performance place this fall and then sodded. The work bee was directed by Trustee Clint Hollingsworth, who brought the large pieces by Tom LaMere's large fork lift machine from where they had been off-loaded near the shoreline from three tractor trailers in recent weeks. Clint fed the big pieces to his dad, Tinker, who was operating the village Volvo excavator. Tinker has a reputation as one of the best operators in the region, and to watch him move those heavy pieces into place, moving them less than a quarter of an inch at times, was testimony to his reputation. The third man on the team was Doug Snyder, who helped the elder Hollingsworth make the final adjustments on the placements, after rigging up the harnesses for each heavy piece. By 2p.m. Saturday, the three had all but a half dozen retaining wall pieces in place, shy a couple a pieces which are still on order. Masonry Contractor Mike Donah of Adirondack Fireplace has offered to tweak with his chipping tools and his know-how some of the pieces so their surfaces and fronts are flush, according to Trustee Hollingsworth. At the base of each retaining wall the village electric department has installed every six feet or so the wiring and fixtures for Ballard-style lighting which will sit on top of small piers. These photos show just a little of the incredible amount of work tackled by the trio that day.